We want to make sure anyone who wants to can attend our shows. It’s why we don’t charge a fee for attendance. We warmly accept donations, but also believe that professional theatre should be accessible to everyone – regardless of their current situation. How accessible are the shows for those with reduced mobility? Our shows are mostly presented in public parks that are meant to be accessible. Most parks have paved pathways that lead to the performance area. However, the space where the audience sits to watch the show is usually grassy and might be uneven (depending on the park). Below you will find a list of parks where we’ve gathered accessibility information, including any barriers to access that may be present. We have many patrons with walkers or wheelchairs who regularly come to our shows. Our volunteer ushers – wearing red shirts – are onsite as of 6pm. They can help patrons who may need assistance finding or getting to a good location. And for those who would like a chair, we rent them for $5 at the concessions tent. If you would like to reserve one ahead of time due to restricted mobility, please contact us at 411@repercussiontheatre.com. What if I don’t feel comfortable during the show? 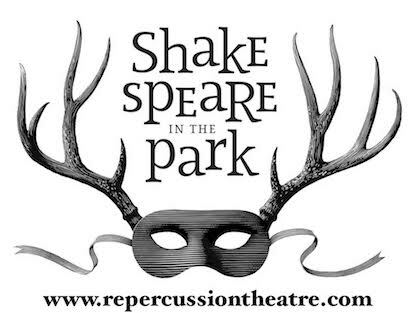 Shakespeare-in-the-Park is a great first theatre experience because at any point you can simply walk away. You’re in a public park (not a closed, dark theatre) and you can come and go as you please. You can stand at the back and stretch, lie down on a blanket, close your eyes for a bit… Do what feels right for you to be able to enjoy the show in your own way. Or, just walk away if that’s what you need to do. The show does involve complex language, but there are also eye-catching visuals, music and lots of action. We work hard to make sure the story is clear for everyone in attendance – even for audience members who may be less familiar with Shakespeare’s text! Kids of all ages tend to love our shows. And the best part is – you’re in a park! So if they get restless you can always go play on the monkey bars. Pour nos ami(e)s francophones, nous avons un application web qui permet de suivre le spectacle avec le texte en français!